A solid recognition program is an investment that pays multiple dividends, but there are a few surprisingly common obstacles that often stand in the way of getting the most from that investment. Some of these obstacles can subtly undermine your recognition program’s goals, leave it floundering with little support — or worse yet — dead in the water. Here are six of the most common obstacles I’ve seen get between an otherwise great recognition program and its success — plus some easy tactical steps you can take to overcome them. 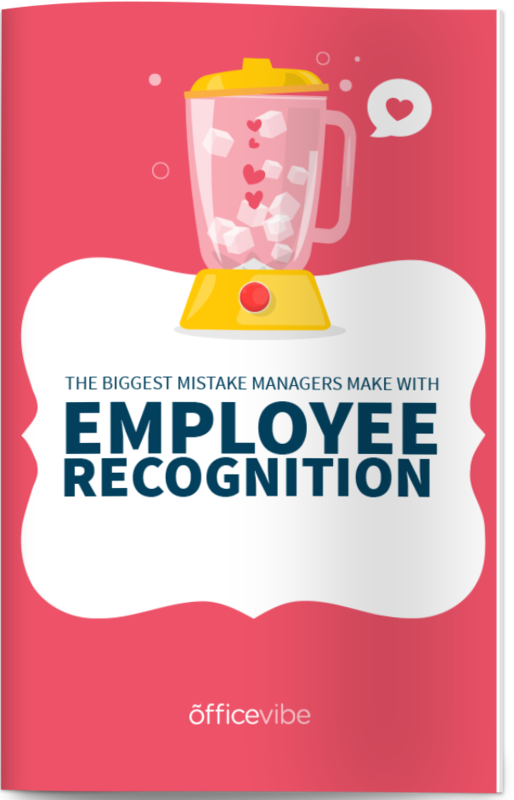 Download this: The single biggest mistake that managers make when it comes to employee recognition. To achieve maximum impact with your recognition program, you’ll need buy-in from every level of the organization. While it may not be possible to get buy-in from 100% of your colleagues and coworkers, each advocate you gain will strengthen your recognition program. Buy-in isn’t just a pass/fail imperative, it’s a crucial validation tool. If the recognition program you’re building struggles to inspire buy-in from a particular cohort, that’s a valuable data point. You can use that data to pin down where the program is lacking for them, and often improve its effectiveness across the board. Building a recognition program is kind of like building a bridge. You’re putting a structure in place to help people get from one place (disengaged or neutral) to another (actively engaged). There are a several crucial elements that need to be in place to keep it strong and sturdy long-term. If you don’t have buy-in from senior leadership, your program is already at risk. Senior leadership’s buy-in isn’t just crucial because they’re usually the ones signing off on the initiative. They’re also your organization’s culture leaders. If the organization’s culture leaders aren’t truly invested and participating in your recognition program, you’ll be hard-pressed to get anyone else excited about it. You may say recognition is important to your organization, but unless that is backed up by leadership, it’s just talk. If you don’t have buy in from management, you’re missing a reinforcing element, and also a key constituency that program is designed to impact. Yes, it’s incredibly important for managers to be engaged, and according to Gallup, managers account for about 70% of variance in employee engagement. Building a recognition program without management in mind is like building a suspension bridge without cables. You may have a strong start point, some good structural elements in-between, and a strong end point, but no way to help your team across the chasm. You need buy-in and participation from managers, department heads, and team leads because they’re the face of organizational leadership other employees interface with most frequently. Their participation and engagement in your program is critical for your organization’s overall participation and engagement. If you can’t inspire buy-in from the ground level, you’ll be missing the support of what is likely the largest constituency in your organization. What’s more, these are often the primary group your recognition program is intended to impact. If they’re not convinced of its value or its authenticity, it will never have the stability it needs for a sustainable future, and it won’t achieve its full potential for impact. Senior leaders of an organization tend to focus primarily on high-level strategy. To earn their buy-in you’ll need to be able to show the positive bottom line impact a program like this has the potential to make. How do you show the potential ROI of a recognition program? There’s plenty of research available that points to the competitive benefits of a more engaged workforce, recognition’s impact on engagement, and its impact on turnover costs. Show senior leaders some evidence of the true returns a recognition program can provide, and you’ll likely gain their support. Managers are often focused on building the necessary environment for their team to consistently produce the best work possible. To earn their buy-in, you’ll need to show how recognition can lead to improvements in productivity. Give them the context they need to see how a more recognition-rich organizational culture will make their jobs easier. Show them why a better recognized employee is less likely to leave, and more likely to consistently produce their best work. Participating in your recognition system should be as simple as it is meaningful and delightful. Skip the mandates — forcing participation might earn you some activity early on, but it’s not going to inspire the self-sustaining engagement-driving powerhouse you’re hoping for. One of the easiest ways to earn buy-in from the team without forcing their hand is to show them how it feels to receive genuine recognition, and how it feels to show appreciation for others. You can achieve this easily by setting a good example, and rewarding participation. Give genuine praise to your colleagues for the contributions they make to the organization, and make a habit of it. Add low-stakes (but still desirable) rewards to your program to provide incentive for sustained engagement without the unhealthy competition a large dollar amount or ‘winner takes all’ format can encourage. The most impactful recognition comes frequently — even daily — yet most recognition programs focus on distant milestones like work anniversaries and annual reviews. Recognition that doesn’t happen in the moment isn’t likely to happen at all. It’s really that simple. But let’s say you do have some way of cataloging all the great contributions people make every day, and plan to recognize and reward each of those contributions. Employees would still go a long time thinking nobody appreciated their hard work. When they finally do receive the recognition, it’s too little, too late. They’ve already experienced the feelings that their work goes unappreciated. Even if that appreciation is still shown in retrospect, it’s too late to take back the time they spent feeling like their work isn’t valued. It may seem like an overwhelming challenge to recognize your entire team frequently for all they do, but you’re not going to have to do it alone. The key to removing this obstacle is empowering and encouraging your entire team to recognize one another’s contributions and achievements. To quote engagement expert Josh Bersin, make it “trivially simple” to recognize colleagues. Prioritize the act of giving recognition as natural and important element of your organizational culture/workday. Empower and encourage everyone in your organization to do the same, whether they’re the CEO, or they started last Tuesday. Recognition works best when it’s not something you have to take time out of your workday to do. It works best when it’s as natural and indispensable a part of your workday as it is to get dressed. When you’ve got everyone in the organization participating on some level or another — trust me — frequency won’t be a problem anymore. Although giving frequent recognition is one of the most important things you can do to strengthen your team, giving inauthentic recognition is simply a waste of time and resources. It’s obvious to the recipient when recognition is authentic. If you’re not really feeling it, you can assume they’re not either. In some cases, it can even be more harmful than helpful because they know you don’t care, and are forcing it. Recipients of inauthentic recognition are also robbed of a chance to better understand the true value they bring to their team. When you recognize people for the contributions they make, be specific about which contributions you appreciate, and why they’re important. It’s not only going to help make the recognition you give more authentic, it will also help the recipient better understand which of their contributions you value most, and why. This is important because those values can differ from person to person. For example: one colleague might be particularly impressed and positively impacted by Keisha’s exceptional attention to detail in code reviews, yet for another, it could be her calm, collected approach to challenging situations. Each of those qualities she exhibits are highly valuable, praiseworthy, and worth developing further. The more times a person is recognized for specific contributions they make, the better they’ll be at making the types of future contributions their colleagues and the organization value most. And that’s something everyone will benefit from. Inequity is one of the few ways a recognition program can backfire and actively harm engagement and morale. Some of the most frequent offenders here are ‘Employee of the Month’ schemes and large annual bonuses. Think about it this way: if you only recognize the value of a few people’s contributions, why have anyone else on the payroll? It’s a problem because you do have other people on the payroll, and they’re all contributing daily to the success of your organization. Those contributions might be less visible, but they’re not any less crucial. It’s a major problem when only a handful of employees are being recognized for their hard work. It’s even worse when those rewards are outsized in comparison to what others might receive for their contributions. Avoid ‘winner takes all’ reward schemes like you’d avoid poison ivy. Recognizing and rewarding just one person for their contributions is like telling everyone else their contributions don’t matter. And that’s not true, is it? Give recognition as widely as possible — include managers and senior leadership too, because they’re often forgotten in a recognition scheme. Make sure everyone receives the credit they deserve for the hard work they’re putting in. Provide rewards for that hard work, but make sure those rewards are given on equal ground. If you need help coming up with some great rewards you can provide that would inspire any member of your team, check out this guide. An effective recognition initiative has a home — and I mean that in both a literal and figurative sense. It needs a home in your daily activities, and in your office — whether it’s being displayed on a big screen in the lobby, across your communication & collaboration tools, during all-hands meetings, or all of the above. If there’s no place for recognition to live, it’s going to be as sparse and patchy as an unwatered lawn in August. Provide a hub for all the recognition going on in your organization, so that everyone can participate, even if they’re not the giver or recipient. That can be something like a Slack channel dedicated to recognition, or a purpose-built platform designed specifically to integrate with your current tools, and make implementing employee recognition as seamless, and effective as possible. You’ll likely find that one piece of visible recognition leads others to add on their own show of appreciation without any outside interference. In truth, there are a lot more ways a recognition program can go ‘right’ than go ‘wrong.’ By keeping a few key considerations in mind, you can ensure the bandwidth you’re dedicating to this effort will return the maximum value possible, and provide your team with the recognition-rich atmosphere they’ve earned.